A.D. 71, and Marcus Didius Falco, Lindsey Davis’s intrepid sleuth in The Iron Hand of Mars, is in Germania Inferior on a mission from the Emperor Vespasian. 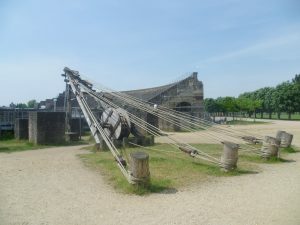 Reluctantly, he goes to Vetera, once a huge double fort on the River Rhine, now bearing all the hallmarks of a savage attack, with broken siege engines, toppled platforms and clear evidence of destruction by fire. A few years before, it had been almost totally destroyed by the Batavian uprising, headed by rebel chief, Civilis, once Rome’s ally. It is only just recovering. I was fascinated by the replicas of Roman building equipment. Here is the crane they would have used to build its massive walls. 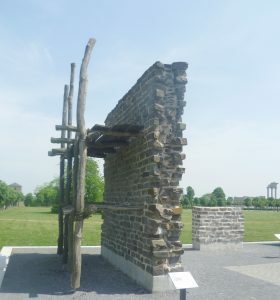 The stone blocks were raised by a winch using manpower. The stone itself came 100 kilometres up the Rhine and was hauled on site by teams of oxen. 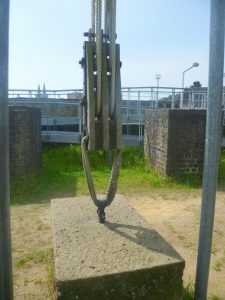 This is the hoist for lifting the stones – it uses a split pin lewis which is a sort of grapnel, inserted into the stone via a specially prepared hole. The weight of the stone when raised causes the lever-like arms of the lewis pin to open and hold the stone. (I assure you that, when it was explained, I understood perfectly!) I hope I’ve been able to give you some idea of how it works. It’s really ingenious. 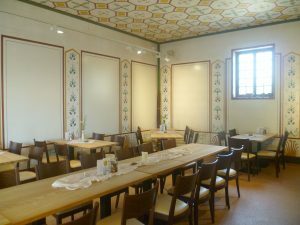 We had a simple Roman lunch in the auberge (no fatted dormice for us). It was basically a green salad (without tomatoes, of course) with hard boiled eggs, and Roman bread. The Roman bread didn’t contain yeast so the flour was softened with milk and butter, and occasionally fermented grape juice which contains a small amount of natural yeast. I can’t say that I was very impressed by the results; but it was 35C and extremely hot and I didn’t feel much like eating. Fortunately, we weren’t expected to lie on couches. Still, we did a lot better than poor Falco who arrived at dusk with his motley band of raw recruits, their tough centurion and a tribune. They weren’t allowed to enter Vetera but were billeted in a wooden hutment on the quayside. Jupiter knows what they got to eat; possibly just some pulmentum, a wheat flour porridge, which would have been pretty basic. After lunch, we saw some Roman scaffolding. I have seen scaffolding like this in Egypt and elsewhere, and it works perfectly well, providing it’s secured properly, as this example was. Next, we looked at Roman transport. 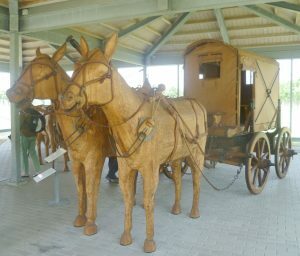 A modern building contained various forms of transport with some delightful wooden horses, mules and oxen and reconstructed wagons and carts. I particularly liked these mules harnessed to a wagon. Falco’s girl-friend, Helena Justina’s mode of travel to Germania Inferior would have been in something similar but with horses and, one hopes, a well-sprung wagon with comfy cushions. 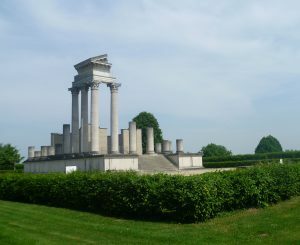 My last photo is of the temple of Jupiter. Only a small section has been reconstructed but enough to give the visitor an idea of how impressive the temple must once have been. Work at the Archaeological Park is always ‘in progress’ and new buildings, like a fine innovative cover building to display the Roman baths, are going up all the time. The whole visit was a real eye opener for me and I thoroughly enjoyed it. I re-read The Iron Hand of Mars with a new understanding. I have just reread “The Iron Hand of Mars”and your photos and descriptions certainly help to place Falco’s adventures in context. I find the German approach to historical sites interesting compared to that of English Heritage (or whatever they call themselves these days). The English purist hard-line of preservation only of the original remains can make it hard to visualise how things were. 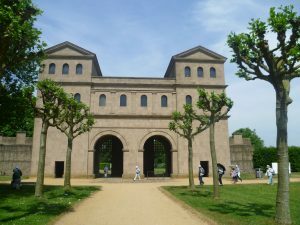 Your experience at Xanten was so different and allowed you to get a real sense of what life was like in the past. Thank you for your comment, Pauline. I think you are right about it being difficult to visualise how a few lined up stones amid humps and bumps in an archaeological site might once have looked. 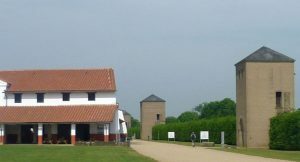 It was quite a shock walking into the Archaeological Park at Xanten and seeing a huge stone tower and a full height stretch of wall. My immediately feeling was: Power. There was no doubt about who was in charge. I love Falco! Your post makes it easier to picture him on the scene – odd to think that the sheer majesty of the place would have been quite common or garden to him. Your description of the split pin lewis reminded me of a device used in rock climbing; I hurried off to consult Wikipedia and I’m happy to report that your definition is far niftier than theirs! Thank you, Prem. I just hope that my ‘nifty’ definition is accurate!